60 x 350mg Veg. Caps. 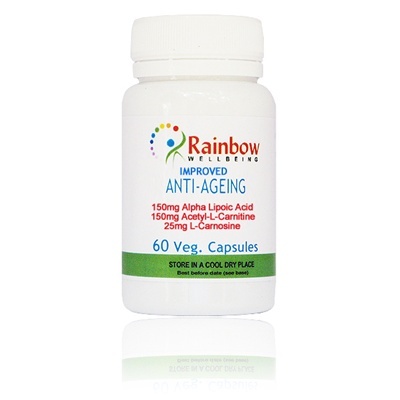 IMPROVED ANTI-AGEING FORMULA containing 140mg Alpha Lipoic Acid, 140mg Acetyl-L-Carnitine, 25mg L-Carnosine & 40mg Vitamin C as Calcium Ascorbate in a Vegetable Capsules. A totally natural & unique antioxidant, the Aids, Enhancements & Supplements/Anti-Aging formula is both water & fat soluble, so acts both inside & outside cells, neutralising the worst types of free radicals (a major cause of degenerative disease). Alpha Lipoic Acid is a sulphur-containing substance that acts as a coenzyme. It may well be the perfect antioxidant. The body manufactures Alpha Lipoic Acid, but supplementing it provides benefits beyond its involvement in carbohydrate metabolism. For starters it is able to deactivite both fat and water soluble free radicals and thereby protect both lipoproteins and membranes; no other antioxidant can do this. 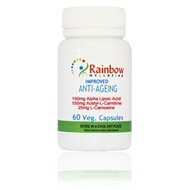 Lipoic Acid may help slow the ageing process. Acetyl-L-Carnitine is not an amino acid in the strict sense it is used by the body to transport long chain fatty acids to the mitochondria in the cells, where it is burned for energy. It is useful for anyone, such as athletes, who want to increase muscle strength and energy or burn fat more efficiently. It works well together with Alpha-Lipoic Acid to improve energy levels. In short, the two are a powerful combination that can improve vitality and help protect against disease; studies have shown that they work together to "tuneÂ the energy-producing organelles that power all cells, the mitochondria - seen as the weak link in ageing .